Microsoft Dynamics 365 combines CRM and ERP capabilities with the goal to ease integration of business applications into valuable and compelling processes quicker and more efficiently. As Dynamics 365 is making its way into enterprises, it must operate within a much more complex system architecture which typically consists of a relatively high number of both Cloud and on-premises systems. Whether it’s in the cloud or on-premise, application integration can save a lot of time and money for your business. Although Dynamics 365 has a wide range of integration capabilities such as those with Azure Service Bus, SharePoint, and Outlook, this blog post focuses on leveraging Dynamics 365 custom actions and plugins to integrate Line of Business (LOB) applications and present Dynamics 365 users with unified view of customer, service, and product data. Dynamics 365 users access enterprise service and data via web forms, web resources, or Unified Service Desk (USD) hosted controls by interacting with Dynamics 365 web services and APIs. As part of the Dynamics 365 web services and API, custom actions can be used to present any service function API CRM and they can be wired with plugins so that when a custom action is invoked, the proper plugins are executed. The plugins can interact with one or more LOB systems (possibly via an Enterprise Service Bus) and may or may not access some Dynamics 365 records. This way, the plugins can implement any integration logic among LOB systems and records. If the plugins do not access any records, the custom action is like a pass through to Dynamics 365 and accesses the LOB systems behind Dynamics 365 transparently via plugins. The plugins for the custom actions can be registered as synchronous or asynchronous, depending on the functional requirements of those custom actions. If they need to return data or result from LOB systems, the plugins are typically registered as synchronous. If they only need to push data to LOB systems and no need to wait for acknowledgements, they can be registered as asynchronous. 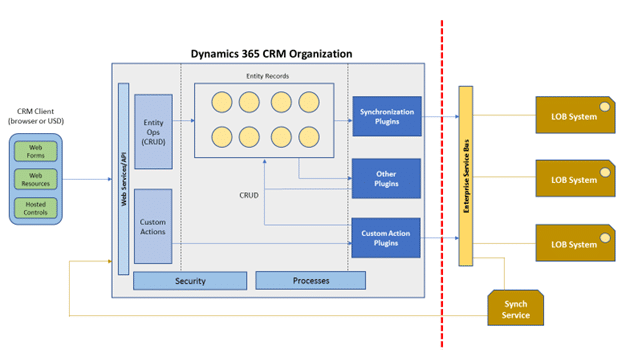 Whether you’re just looking to customize the Dynamics 365 experience or looking to leverage relationship tracking capabilities beyond typical CRM scenarios, Dynamics Resources Inc can build a custom Dynamics 365 integration solution that is right for you. We provide affordable and professional application integration solutions for your business. View our list of services and products to see how we can help you. The next step is yours, call today to speak with one of our Dynamics 365 Experts.